Some people can start a fire with green two twigs in a monsoon, but others among us prefer to do things the easy way. 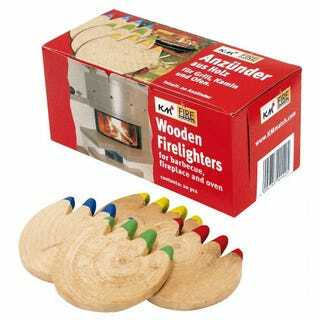 These KM Firelighters are essentially gigantic matches—so big, in fact, that the kindling is built right in. I can't imagine the fireball and plume of smoke these things emit when scraped against your rough, expendable surface of choice—seriously, each match is so large that you can count the tree rings—but I can appreciate the four, Crayola-like colors sure to tempt children into horrible coloring disasters.